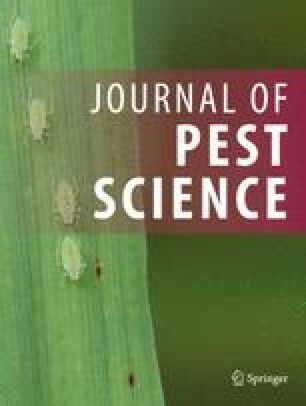 Survey studies of Aleurothrixus floccosus (Maskell) (Homoptera, Aleyrodidae) and its parasitoid Cales noacki Howard (Hymenoptera, Aphelinidae) were made in 4 provinces; namely Adana, Mersin, Hatay and Osmaniye, which are the main citrus growing areas of the East Mediterranean region of Turkey. Inoculative parasitoid releases were made in regions where no or low natural parasitism occurred after obtaining preliminary results on presence of the parasitoid. The population dynamics of A. floccosus and C. noacki were examined in Silifke (Mersin), Dörtyol (Hatay) and Yüreğir (Adana), where the A. floccosus population was remarkably high at the beginning of the study in 1999. However, after parasitoid release, the pest population declined in all the sites and did not attain the same high levels again. Five predators, three parasitoids and one entomopathogen species were determined as natural enemies of A. floccosus. In addition, seven plant species, six of them belong to Rutaceae, were found as host plants for A. floccosus.